The AoFAQ Level 2 Award in Cardiopulmonary Resuscitation and Automated External Defibrillation (QCF) qualification has been developed to provide learners with the knowledge and skills to administer basic life support and use an AED in an emergency. 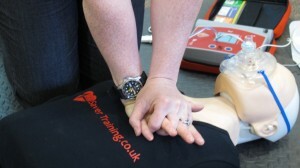 Early defibrillation and CPR are vital in the chain of survival following a cardiac arrest. This course is able to provide learners with the knowledge and skills to operate the AED safely. It meets the HSE and the Resuscitation Council training recommendations for use of AEDs in the workplace.